The versatile clear appearance of a Vision glass elevator blends into practically all interior decor styles, from conservative to eccentric. Unique style is not the only facet setting Vision systems apart from other residential elevators, however. A compact design that can be installed into even the most limited spaces, improved accessibility, and less preparation make these residential glass elevators some of the most practical. Not being able to access levels beyond the ground floor is a significant obstruction, preventing full independence and creating a limited environment for a homeowner or family member. If, on the other hand, a residence has reduced or narrow space, the options for an elevator are few. 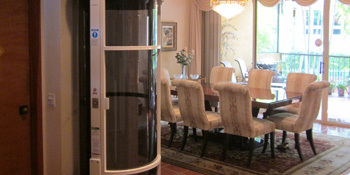 Vision residential glass elevators go where other home systems cannot. Because a machine room and a pit are not necessary and a constructed hoistway is superfluous, Vision glass elevators can be placed nearly anywhere. 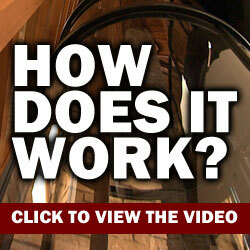 In a home, a system can either attach to a balcony, or a hole can be cut in the floor for the elevator to pass through. While a similar clear acrylic hoistway and cab are the foundation for all Vision elevators, each system has its unique characteristics. 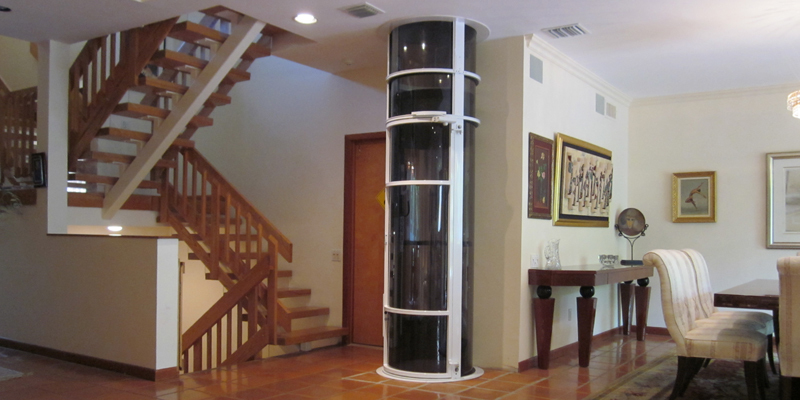 The most economical, the Vision 350 is a pneumatic glass elevator with a 32-inch diameter and 350-pound capacity. The Vision 450, slightly larger in size, is essentially a two-person residential glass elevator. With a 450-pound capacity and 37-inch diameter, this Vision elevator is our most popular model. Large enough for wheelchair access, the Vision 550 supports up to 525 pounds and has a 52-inch diameter. The Vision 350, 450, and 550 are built for residential structures only and travel up to four stops. For homes and commercial structures, the Visi-58R and the Visi-48S are cable-driven glass residential elevators. With 830- and 744-pound respective capacities, both systems offer significant interior space for wheelchair access. Standing apart from all other systems, the Visi-48S is constructed with an octagonal shape, complimenting even the most conservative spaces. For expanding access inside a home, increasing mobility for all, and adding an attractive, compact glass fixture, contact us to discuss our residential glass elevators.